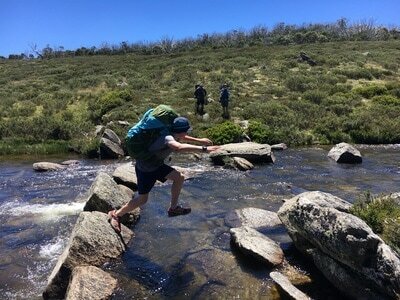 Following our very successful 7 day hike on the Overland Track in Tasmania in April 2016, a new plan was hatched to complete an even bigger expedition. 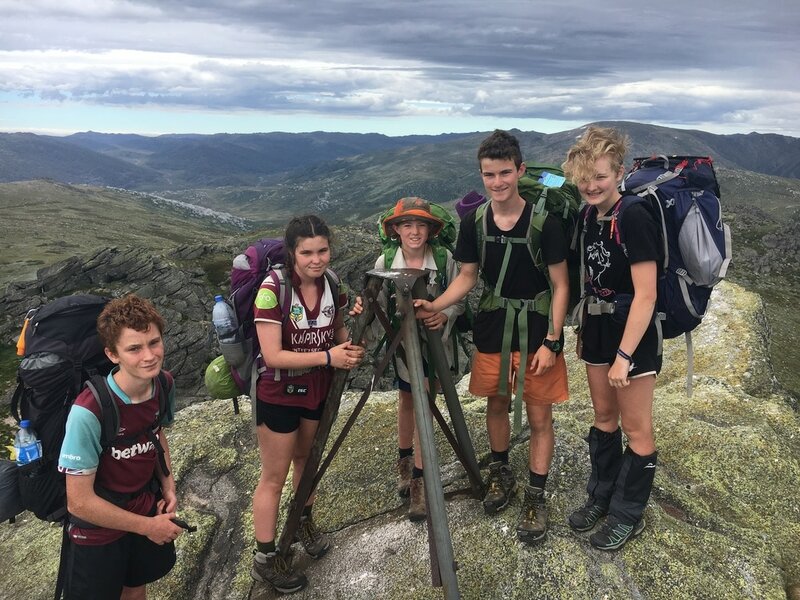 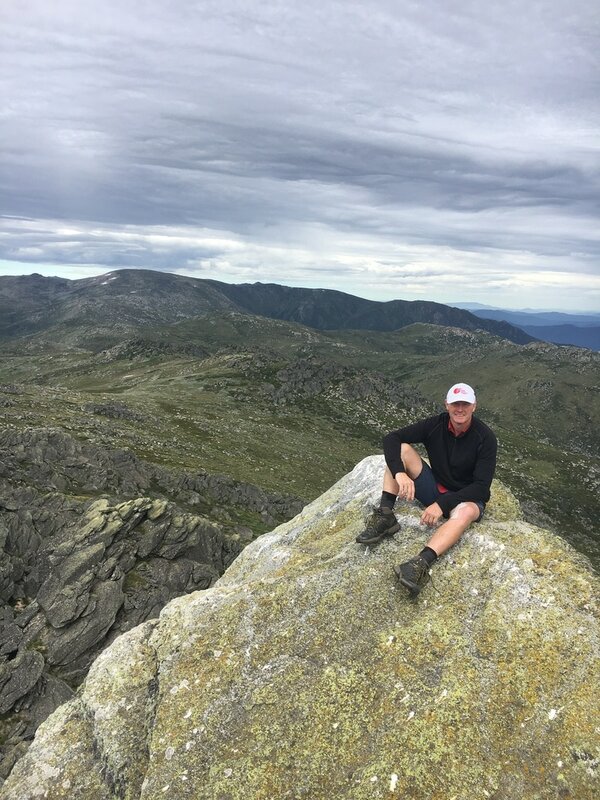 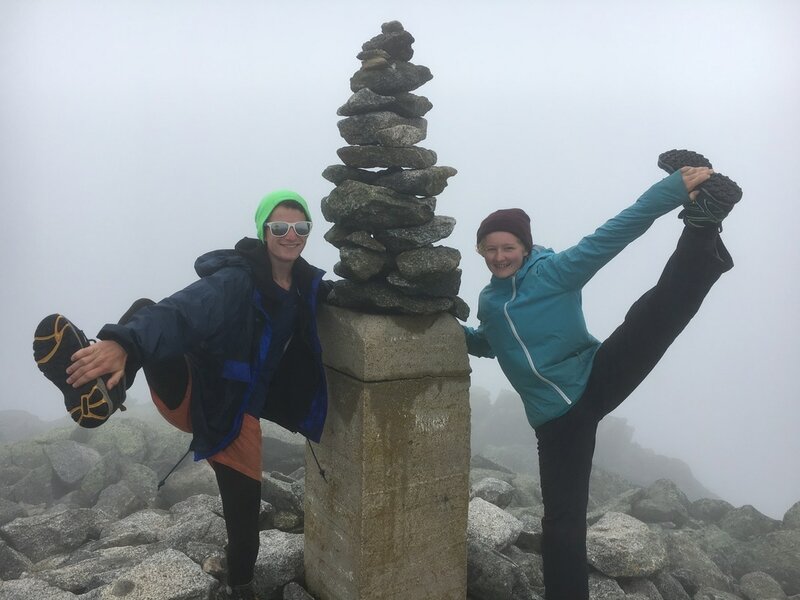 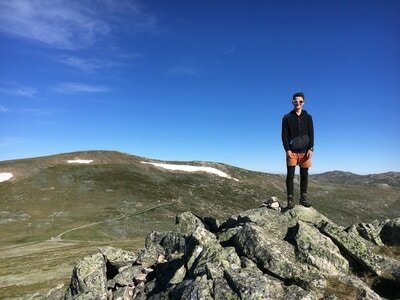 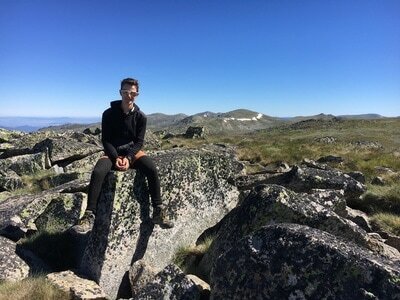 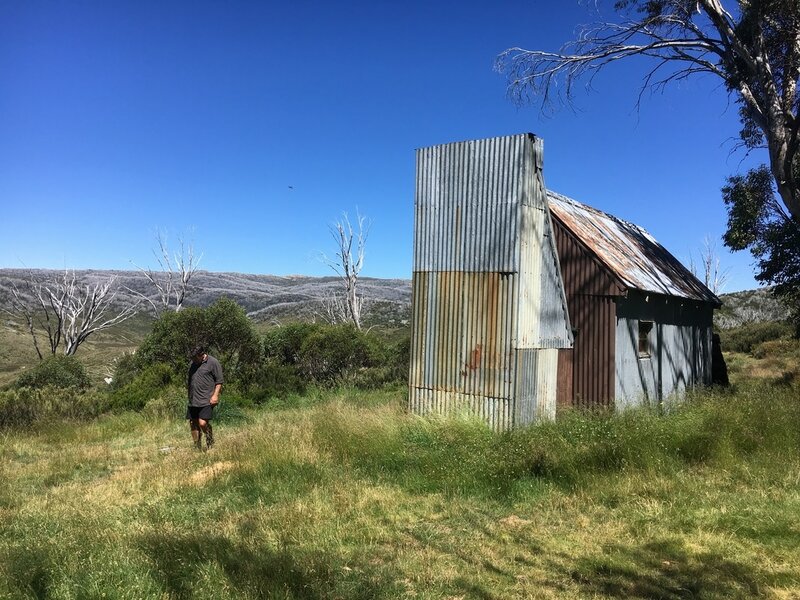 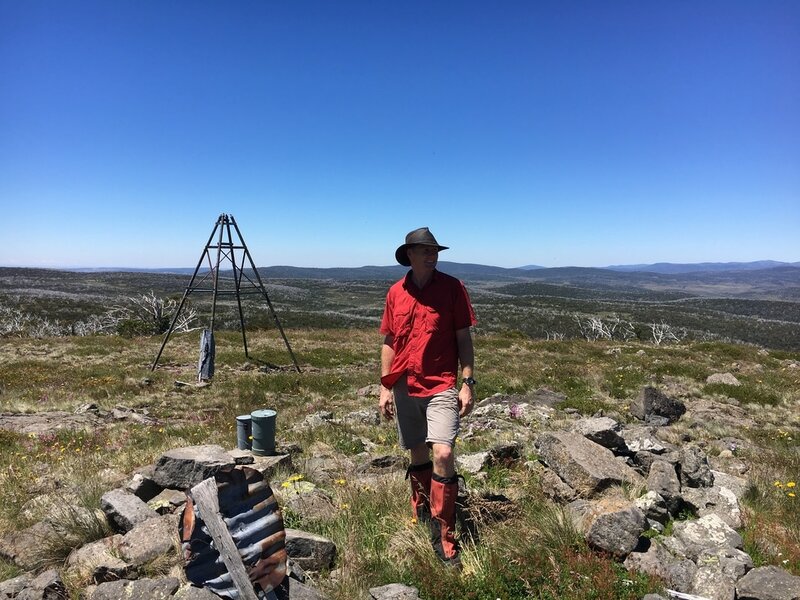 The idea was to hike from Kiandra in the North of the Snowy Mountains National Park to Kosciusko in the South and at the same time summit the highest 10 mountains in Australia. 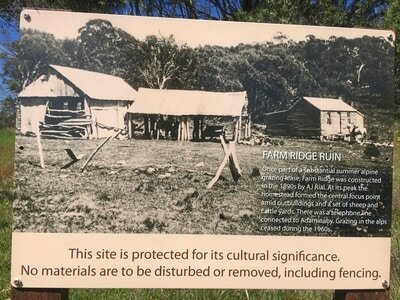 How do we get back to our cars at Kiandra after walking 130km. 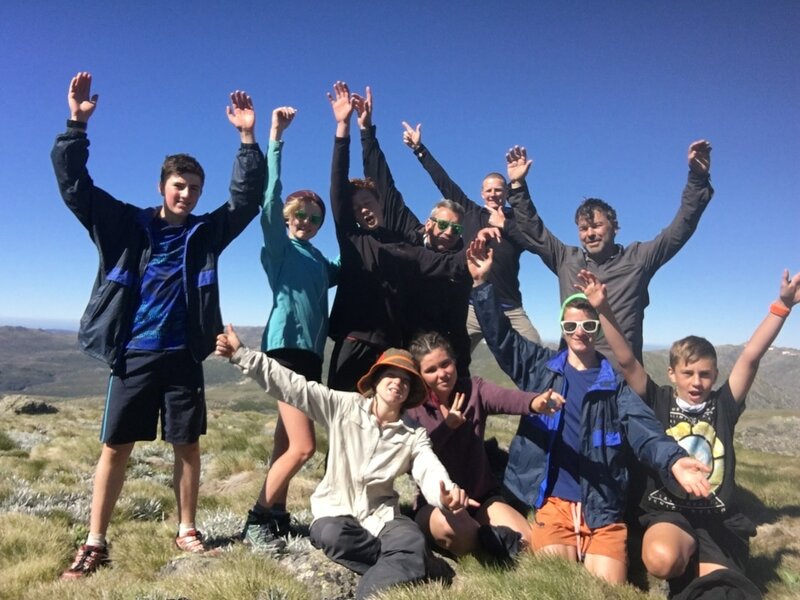 The first problem was readily solved by hiring a mini bus through Snow Alliance (a local bus company to the Snowy Mountains). They picked us up in Thredbo and delivered us back to our cars at in Kiandra at the end of the trip. 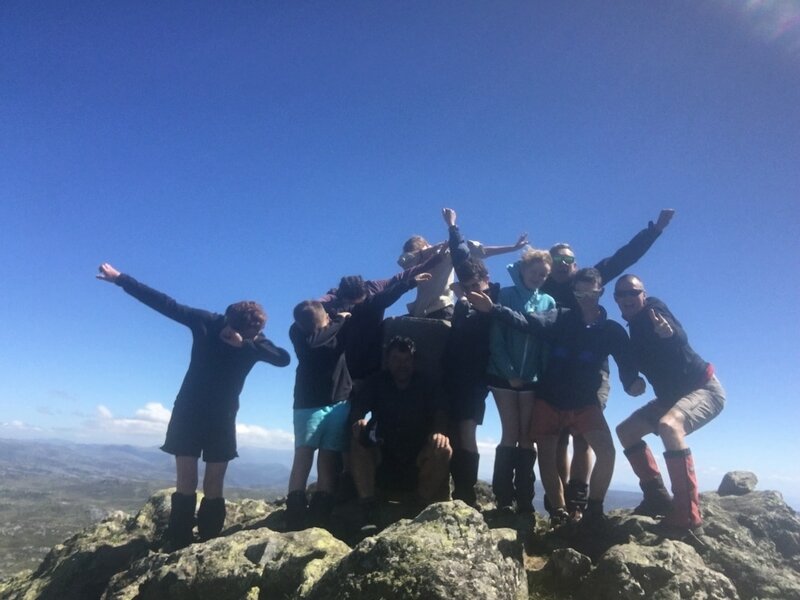 Due to the age of the kids coming, I also broke each days hike into manageable chunks with the biggest day being 16km (although side trips could be completed, which would add to this distance, these would be done without packs & were up to how each member of the party was feeling at the time. 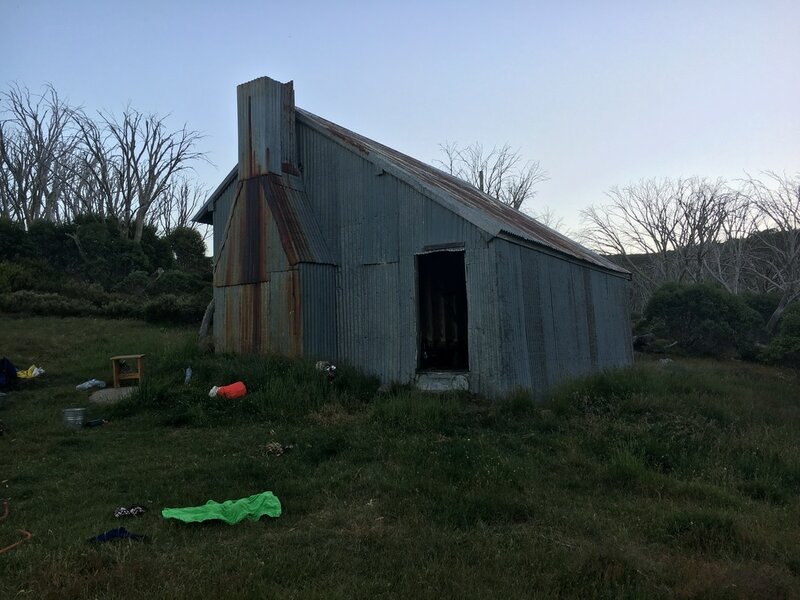 Our route was very close to the one in the above picture with a couple of small modifications (we stayed at Grey Mare hut rather than Derschkos and also in a valley off Mount Anton/Twynam rather than Mt Anderson Saddle). We all opted to eat freeze dried meals for dinner & dessert and I managed to source these for the group at the wholesale price (thanks very much to Cameron at Equipped Outdoors in Waitara). Lunches for most of the party was predominantly made up wraps or vita weats with an assortment of toppings (salami & cheese for the first few days or salmon (which can be purchased in a packet rather than tin), Nutella for others etc. 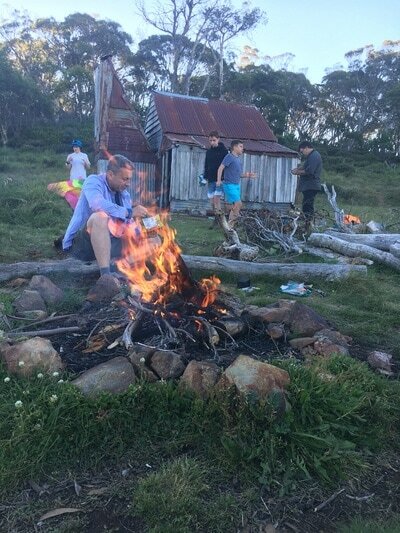 Breakfasts were usually some form of cereal (instant porridge, muesli, weet bix go etc with powdered milk). 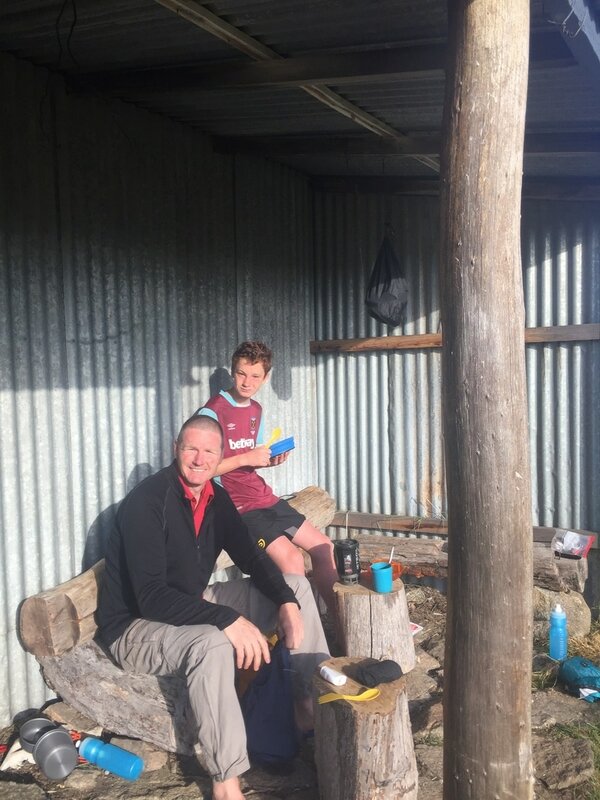 Snacks on the track varied with most opting for muesli bars or protein bars and some form of scroggin. 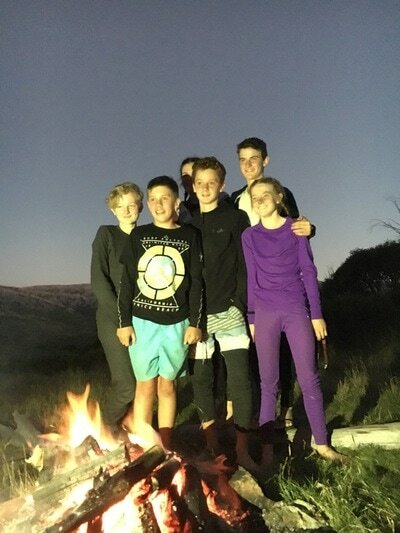 All up the food content for each person was somewhere in the vicinity of 6.5kg. The final bit of planning included a spare night on the hike in case poor weather was encountered and we needed to bunker down for a day or two. 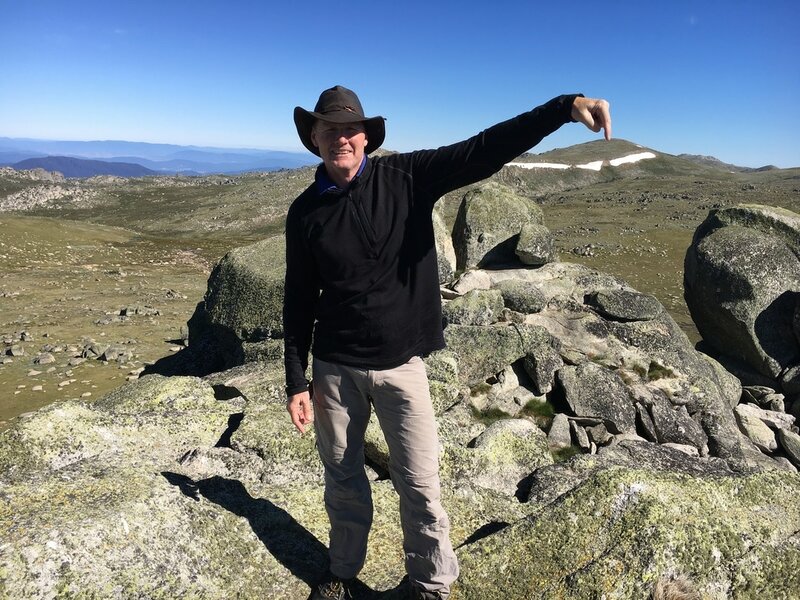 If this was not needed it would be spent up on the main range at the end part of the hike so that we could do some “peak bagging”. 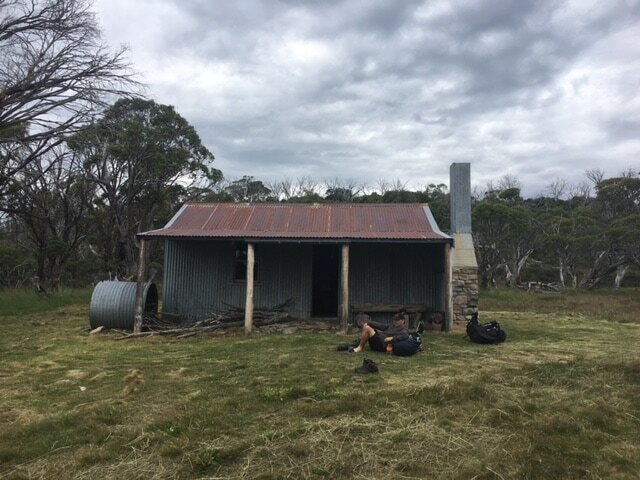 Arrived at Dunns Hill Kiandra in the early afternoon for a short 7 km hike to our first campsite at 4 mile creek Hut. After leaving the cars, the track goes uphill for the first 1.5 kilometres (150m vertical) on to a plateau that we then stayed on for the rest of the day until the final descent to the hut. 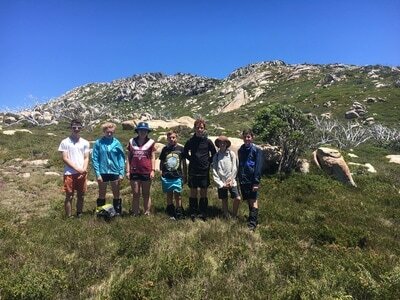 Some hills to go up and down today as we continue down the well defined fire trail and around Tabletop Mountain. 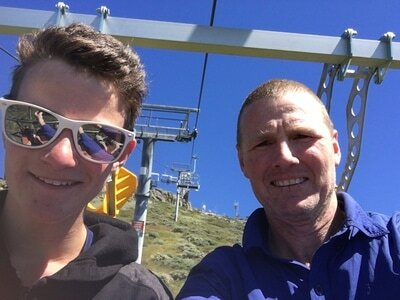 4 of us did the short climb up onto the top from the track (Nev,Jonah, Jeremy and me). 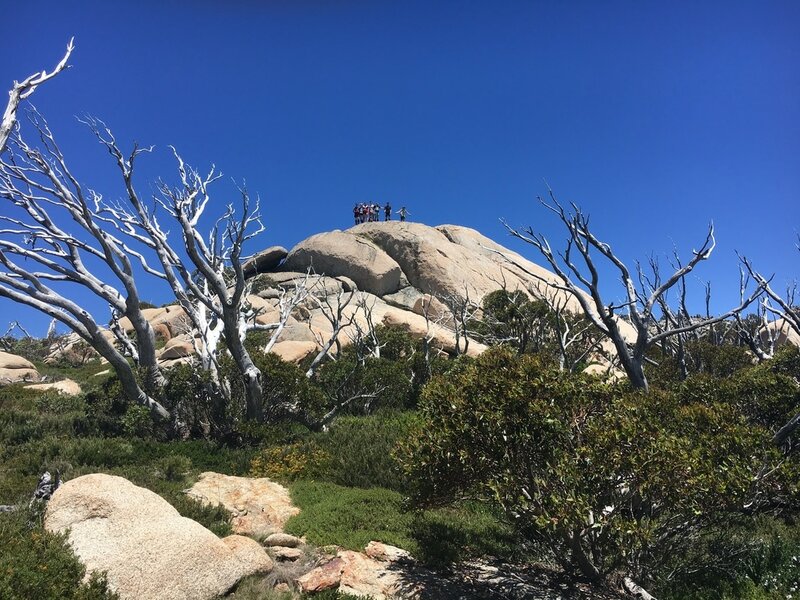 A trip that is well worth the effort as you get uninterrupted views for the full 360 degrees. 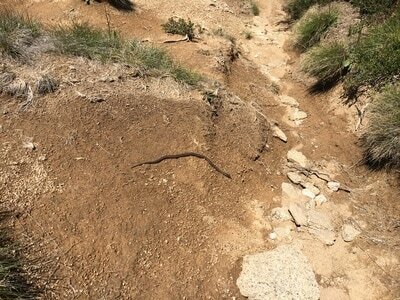 There is no track up there but it is readily accessible from the ridge half way along the trail around the mountain. 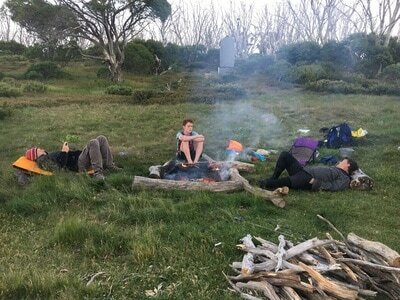 A combination of a late night for the kids and a hot day meant that we travelled a little slower than expected and by the time we reached Happys Hut, some of the party were a bit tired and we decided to spend the night here rather than continue the 3km cross country trek to Brooks Hut as planned. The hike down the final ridge to Happys Hut is off track and through waist to chest high scrub at times. 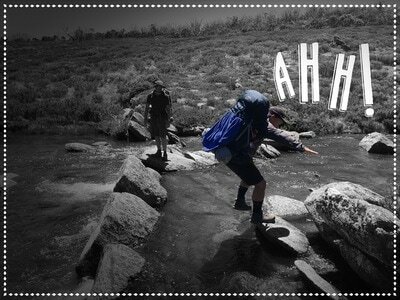 Even so it is not difficult to navigate. 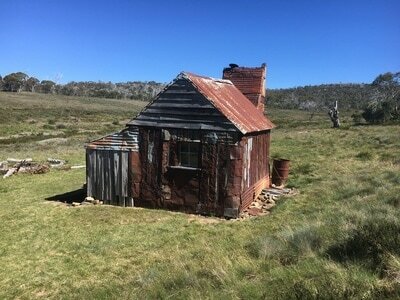 Happys Hut is a fantastic little cottage with a verandah and spectacular valley views. 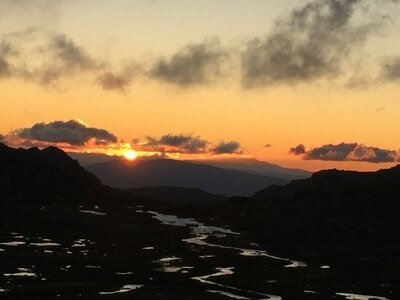 Awoke from the verandah to a spectacular sunrise and we soon got moving towards Brooks Hut. 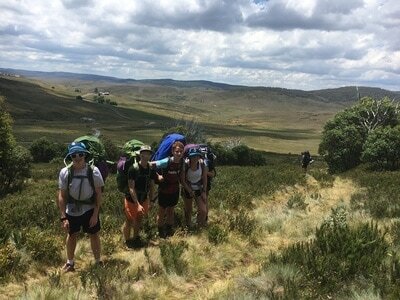 Because we finished early yesterday we need to complete an extra 3 km today. 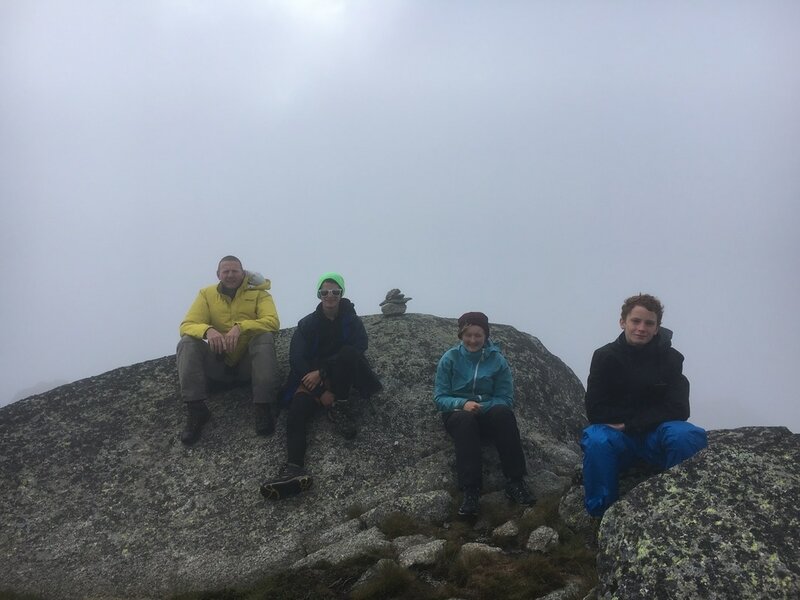 Most of the day was spent under high cloud cover, which kept the temperature down. 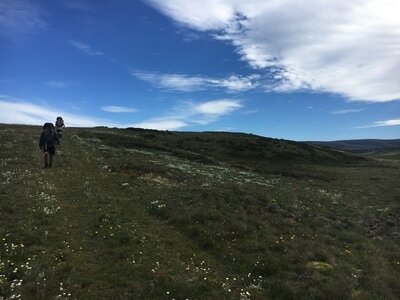 The off track section across to Brooks Hut proved to be quite easy with open button grass hiking. 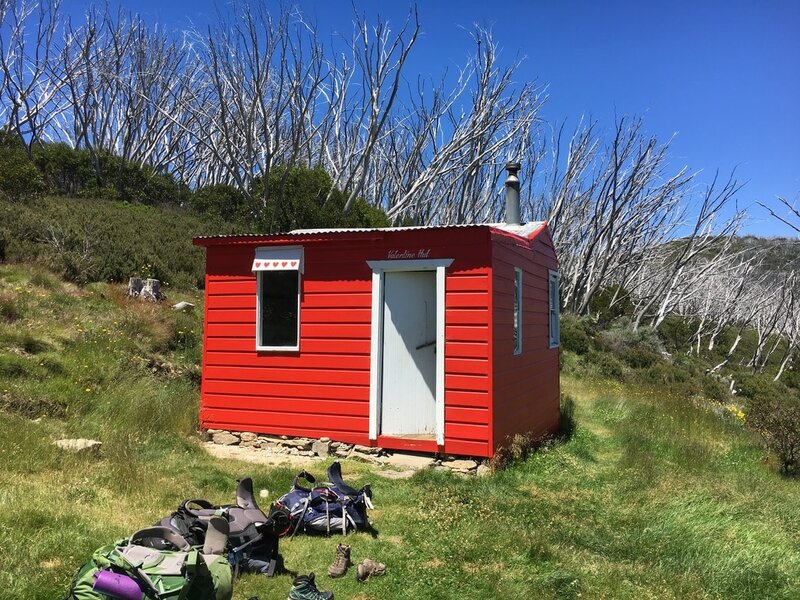 Once back on track we made good time down the Grey Mare Fire Trail to Mackays Hut. 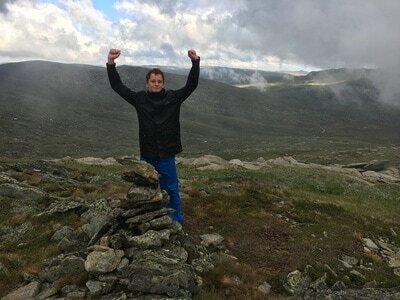 Two hills with vertical ascents of about 100m punctuated the day. After the night of rain we awoke to beautifully clear skies. 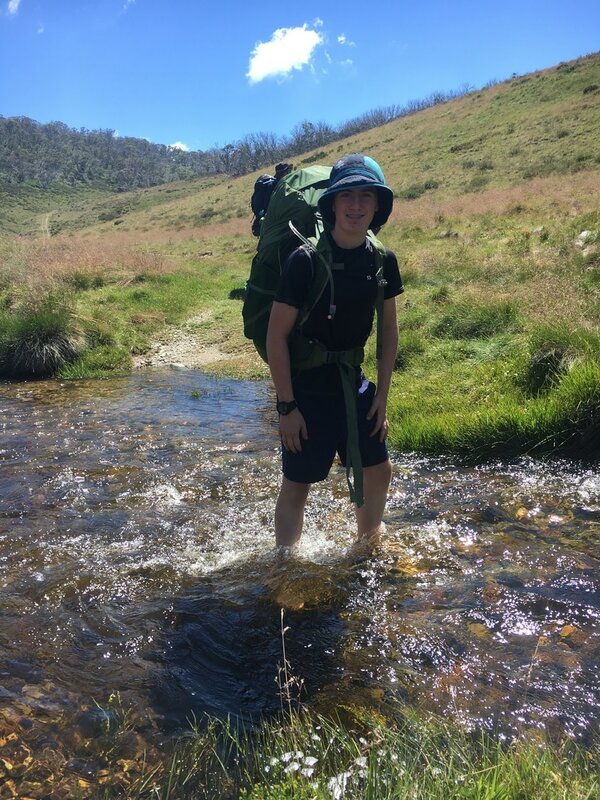 The creek out the front of the hut was flowing about a foot deeper than the previous afternoon, testament to the amount of rain that fell during the night. Today is only a short day of about 10km as it is planned to summit Mt Jagungal in the afternoon. 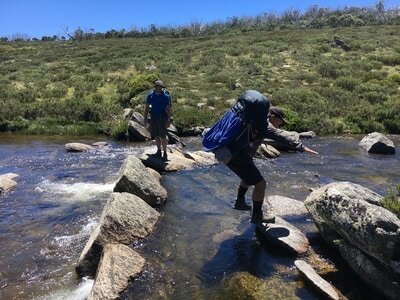 The highlight of the morning was crossing Doubtful River, which was flowing quite strongly and care needed to be exercised. 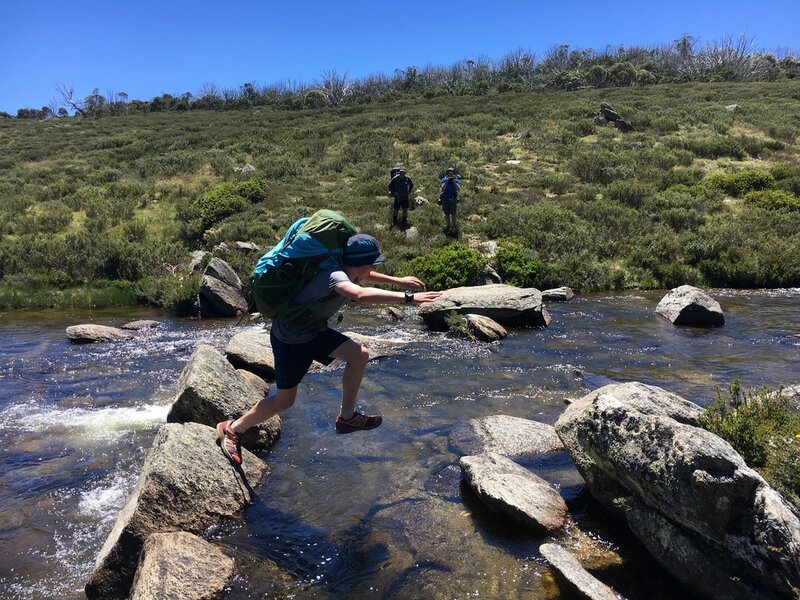 By finding a shallower place upriver I was able to stand on a rock where the current didn't affect me and help the team across. 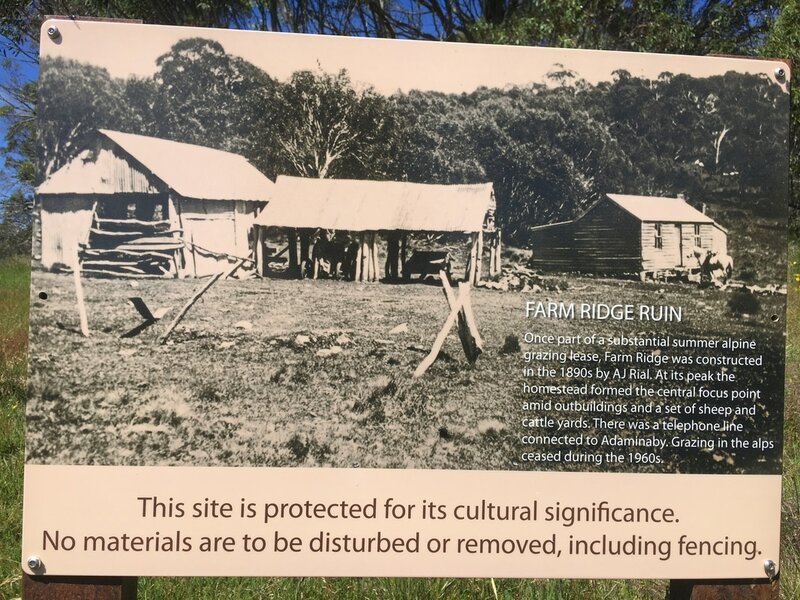 We then climbed out of the Doubtful River valley and up past the ruins of Farm Ridge homestead, an old summer grazing lease that was built in 1890. 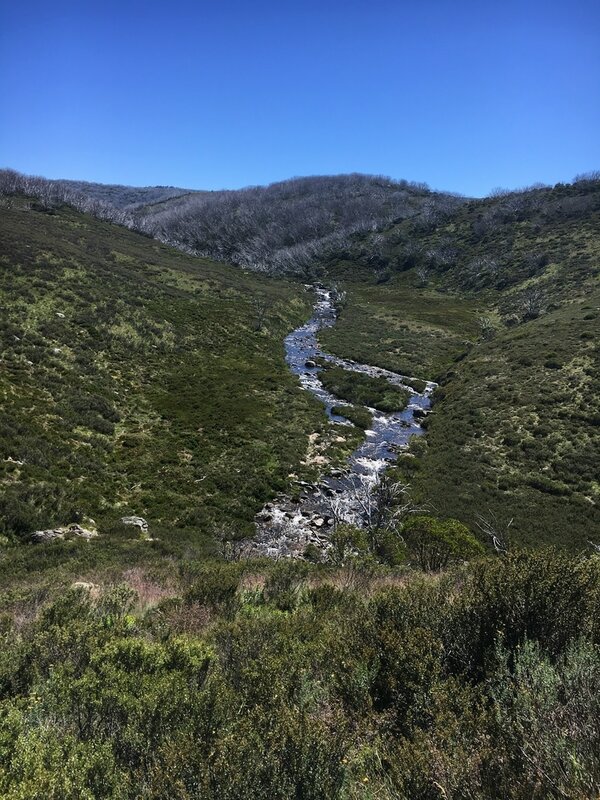 The clim is quite solid (about a 120m ascent) and we descended straight into the next valley and crossed Bogong Creek, which wasn't flowing nearly as strongly as Doubtful River. 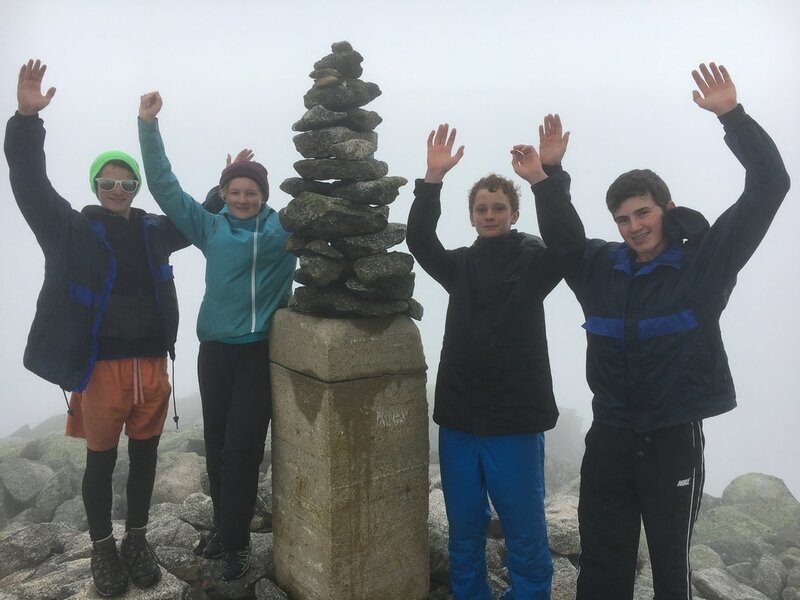 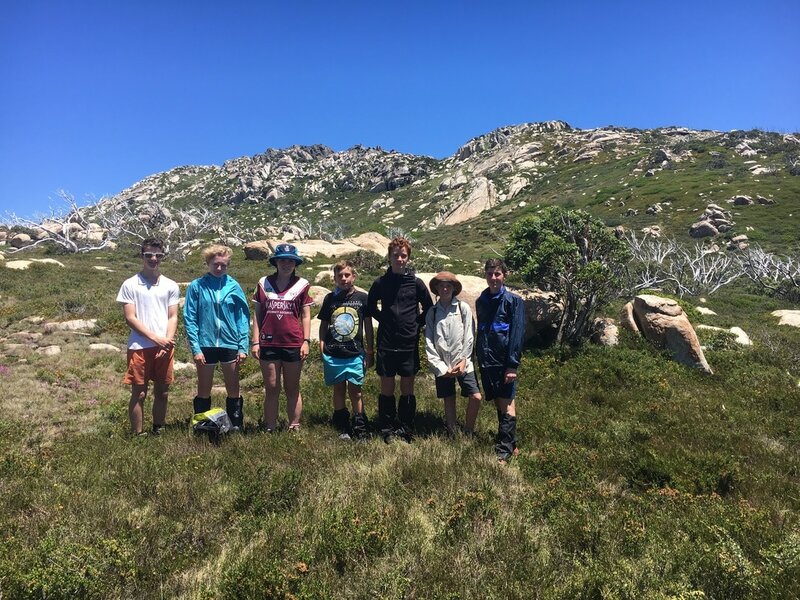 The final climb up to O'Keefes Hut was another solid climb of about 1.5km and 120m ascent. 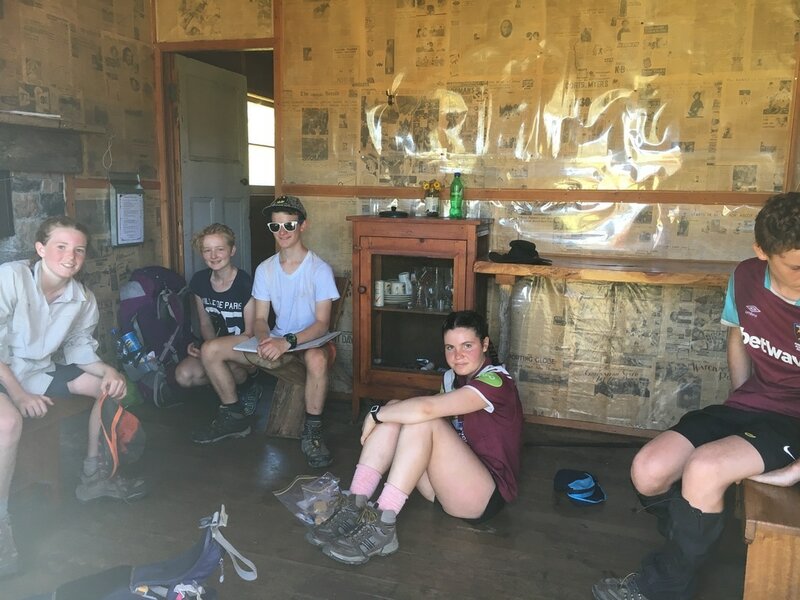 Having arrived by midday we had lunch at the hut and then started the climb up Jugungal via the ridge behind the hut. 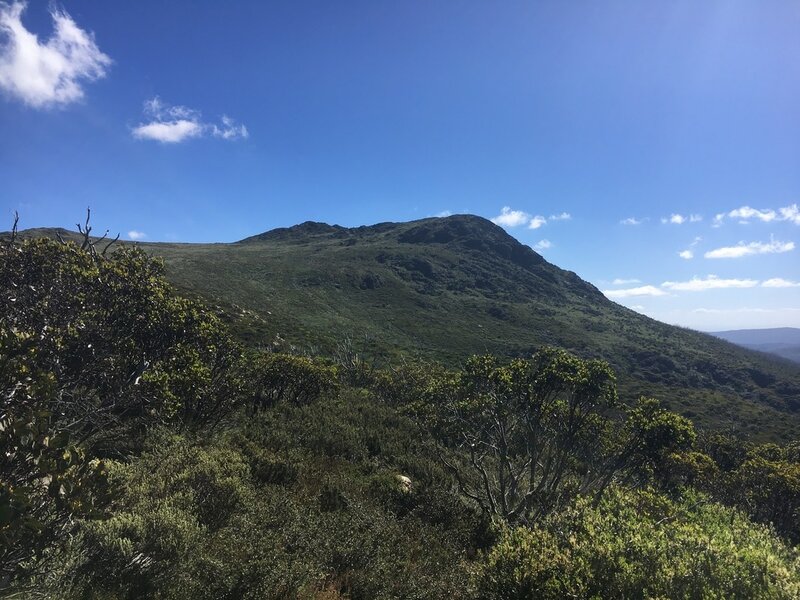 It is a big climb of about 450m over 3.5km and the first 2km is a bush bash through scrub. The descent was a whole lot quicker as we picked a different ridge to come down and the found a small creek that was clear of scrub all the way to the bottom near the meteorological station. 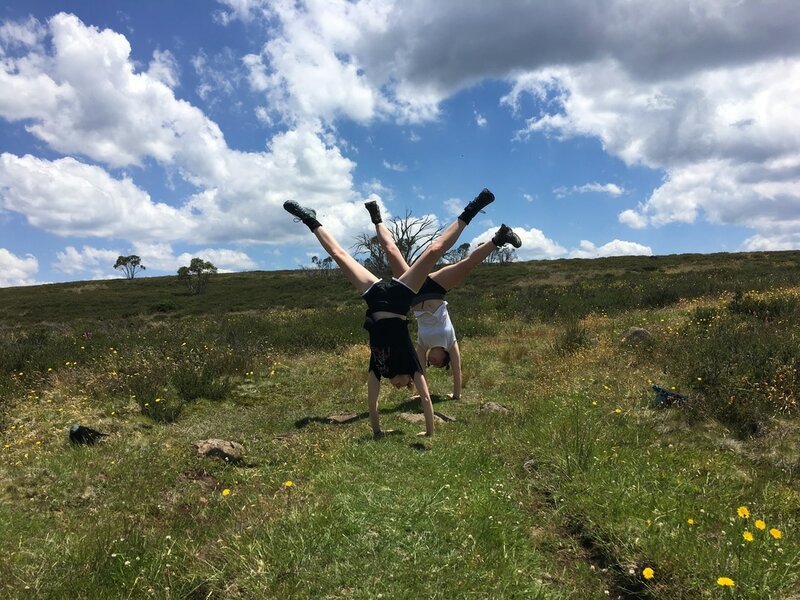 Note: Mt Jagungal is much easier to approach from either Tumut River (near the Round Mountain Fire Trail junction) or from the south. We woke up to frost this morning after a chilly night. 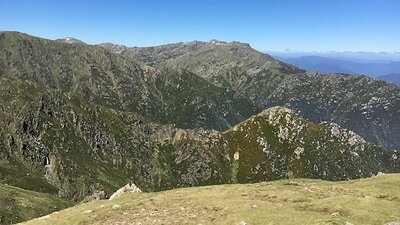 An easy day today with only one small hill to negotiate in the afternoon. 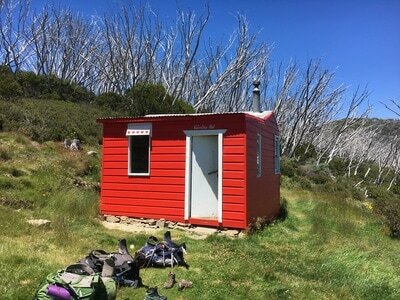 The weather is picture perfect as we travel all day around Mt Jagungal to Grey Mare Hut. 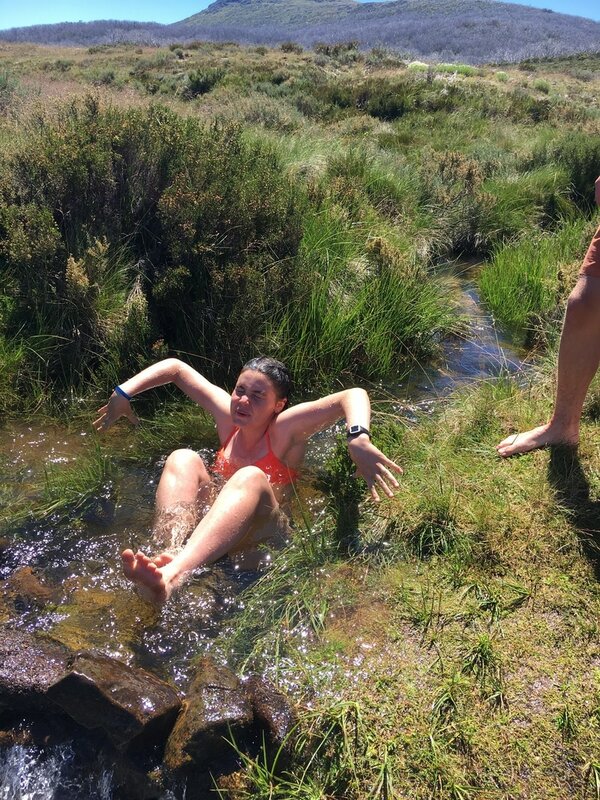 We took it quite easy and had a "dip" in the Tooma River at lunchtime. Being an easy day we arrive quite early to the hut, which is up a long drive from the trail and Back Flat Creek. As it was early a good weather we took the time to wash some clothes and ourselves. 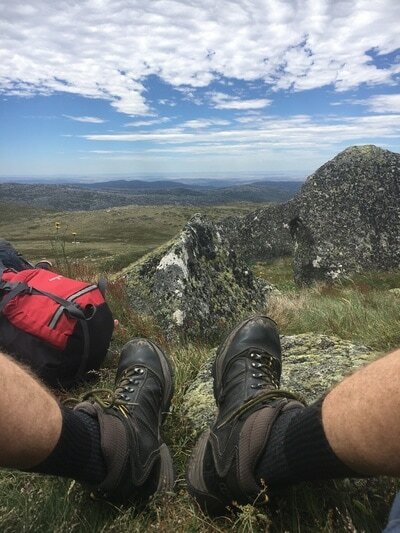 Another perfect weather day today. 5 creek crossings in the first 2kmand then a long uphill across a ridge and back down to the Geehi River where we had morning tea and a quick dip. Another long uphill and our next stop was Valentines Hut for lunch. After lunch 6 of us took a side trip down to Valentines Falls, which is well worth a visit. There is a foot pad that goes to the top of the Falls but disappears at that point with many fallen trees now blocking any old route. 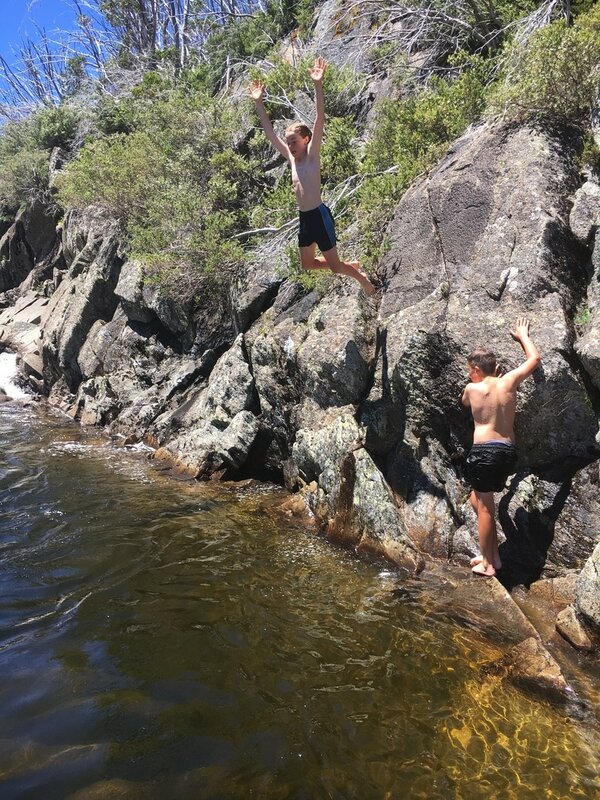 A swim in a deep pool near the top of the Falls was very refreshing and not too cold. 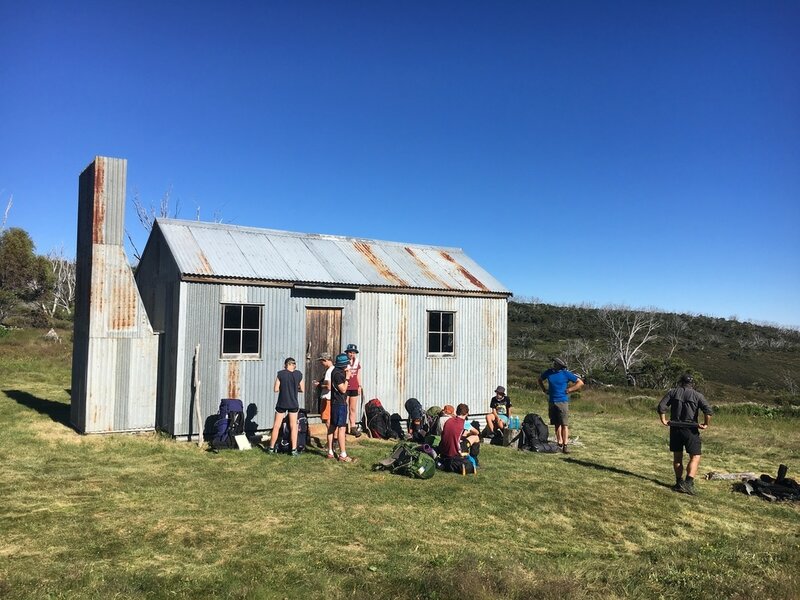 After returning to the hut we picked up the rest of the group and tackled the afternoons challenge of finding Mawsons Hut, which is about 3km cross country and off track from Valentines Hut. Whilst the terrain is open country for the most part it is energy sapping crossing the button grass and marshy areas that predominate the area. We finally arrived at Mawsons at about 5pm after a hard day. Another great campfire under the open starlit skies  whilst Mark pointed out the satellites as they passed. Today we headed up "The Kerries" and over to Gungartan. A strong NW wind dominated the day and most of it was spent under cloud cover. The Kerries offer spectacular open high country walking with fantastic views afforded the whole time. 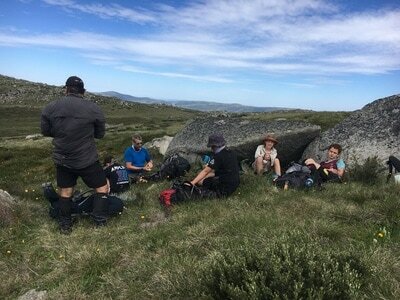 We sighted another herd of Brumbies up on the range and enjoyed lunch trying not to get blown off the top of Gungartan. 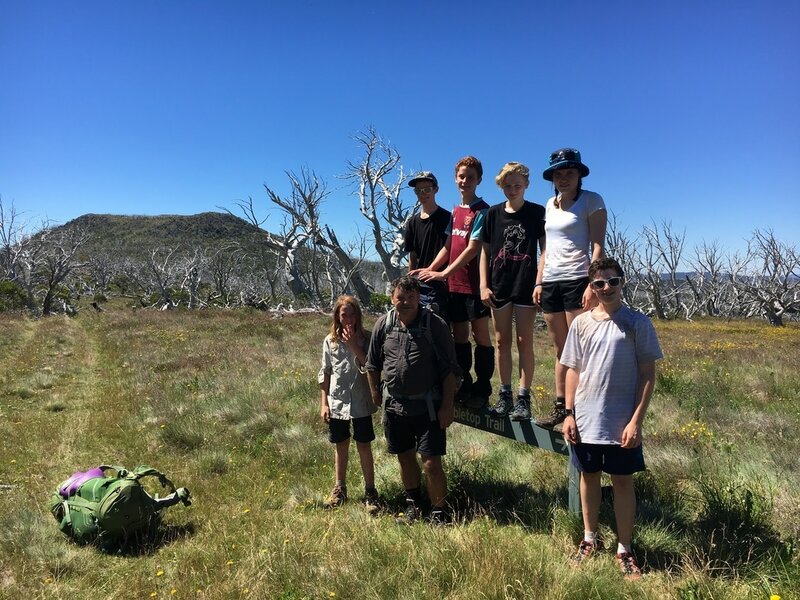 Our descent down to Whites River Hut was less than ideal as we ended up in a creek that was heavily overgrown and not very pleasant. 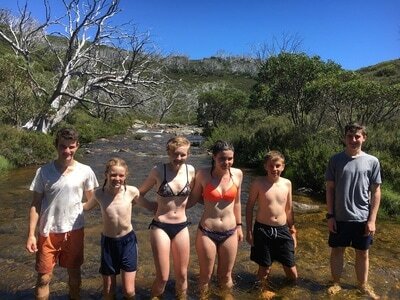 Another swim/wash in the Munyang River just before heading up to our last hut for the hike. 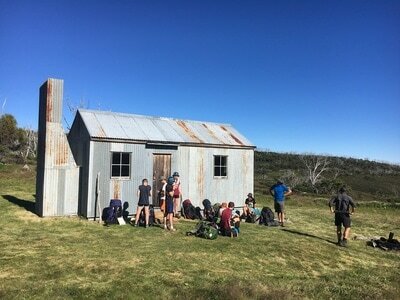 Left Whites River Hut and followed the trail up to the Rolling Grounds. The weather was overcast and windy but navigation was not an issue. 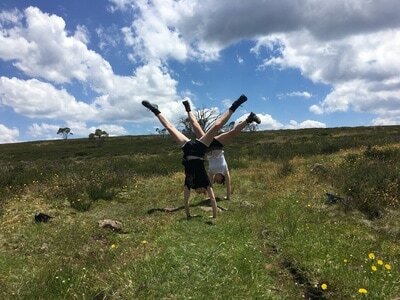 Continued along and down through Consett Stephen Pass and from here a track was fairly evident (although we did lose it a couple of times). 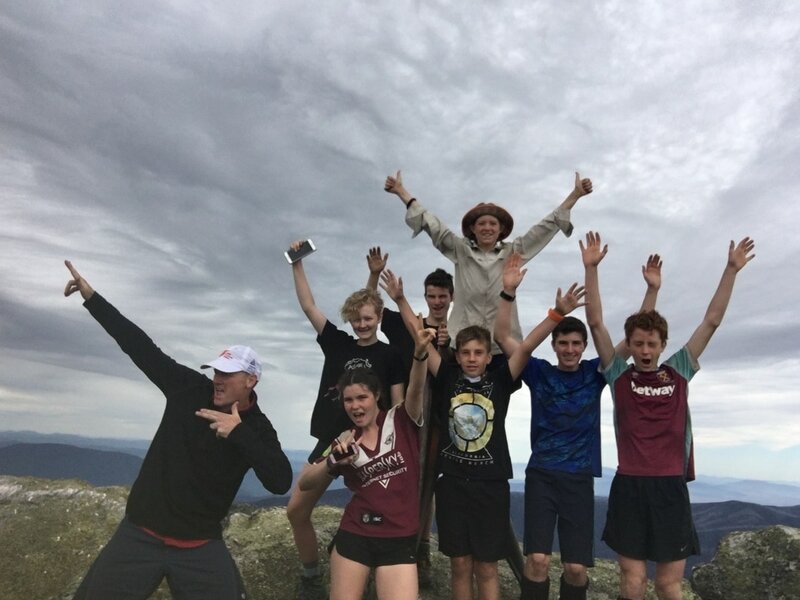 We summited Mt Tate, Mt Anderson and Mt Anton. 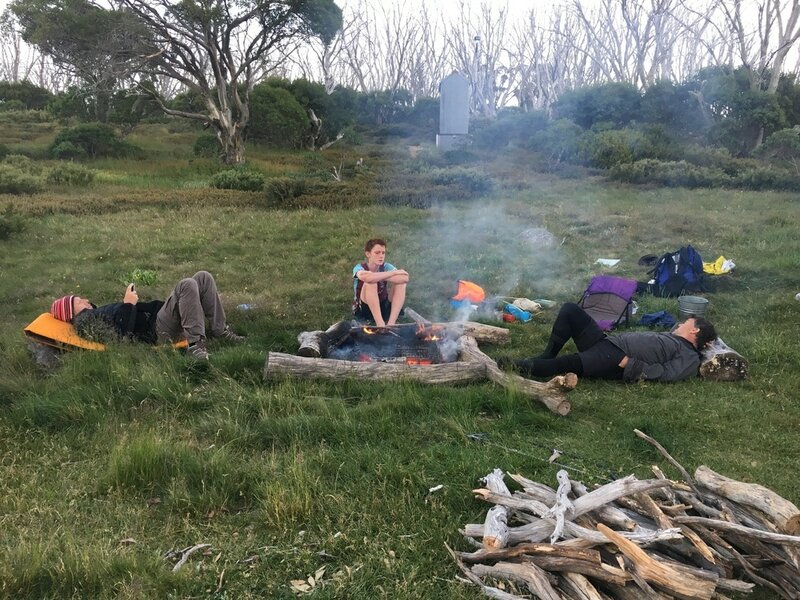 It had been raining very lightly during the afternoon so we made camp in the lee of Mt Twynam down near a creek, not too far from where we had planned. 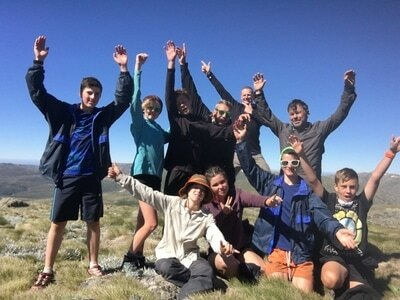 The kids went off and played in a snow drift just below Mt Twynam and found a great snow cave. 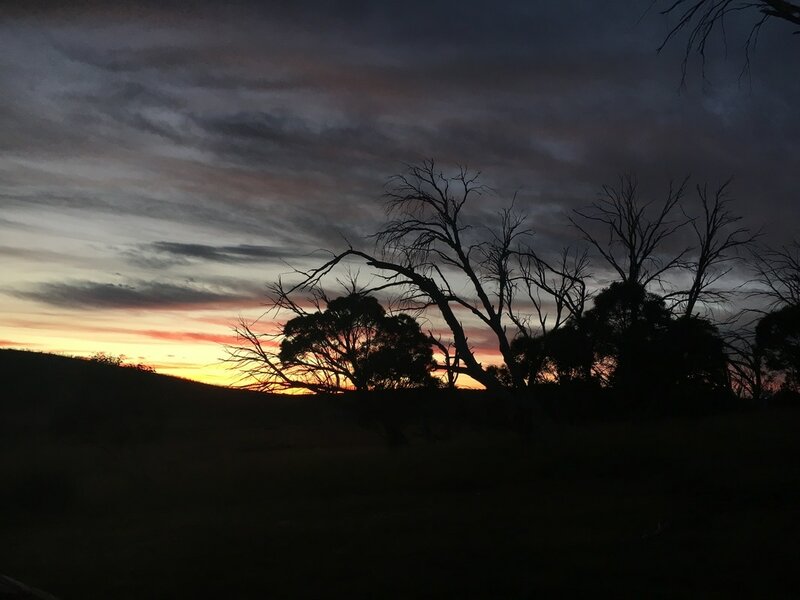 The wind finally abated in the late afternoon and the evening was clear and calm. After checking the weather forecast for the next few days we have decided to move camp today and base camp over at Wikinsons Creek as Today will be fine but the next day (Friday) looks like bad weather and it would be better to be already set up rather than hiking through bad weather and then needing to re-establish camp. Started the morning by summiting Little Twynam and then crossed the saddle and climbed Mt Twynam. 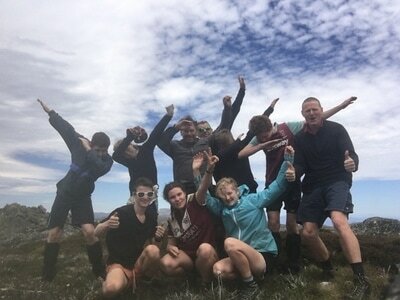 Continued through to the summit above Watsons Crag and then back on track through to Carruthers Peak passing on the way Blue Lake, Hedley Tarn and Club Lake. 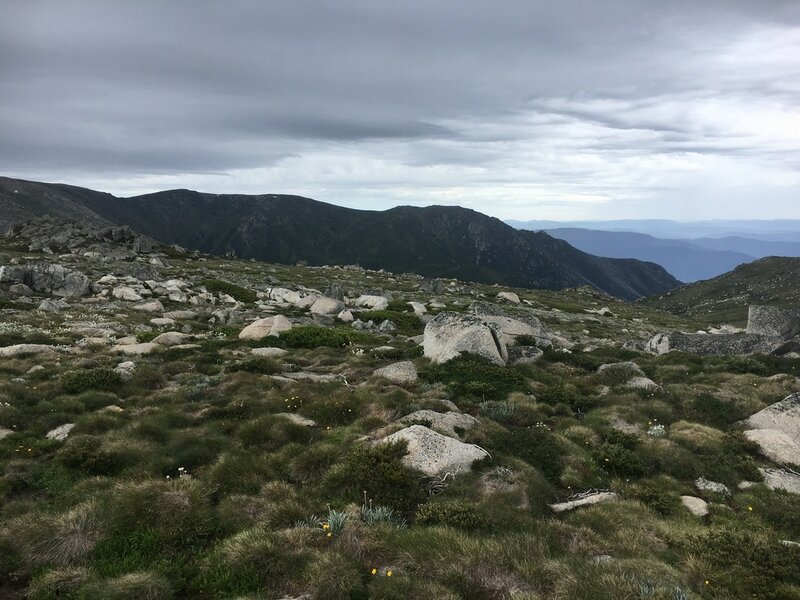 We had lunch on Carruthers Peak and continued down the range with Jeremy and I going over Mt Lee, and Jonah, Jeremy and me climbing Mt Northcote and Mt Clarke, whilst the rest of the party stayed on track and went around. 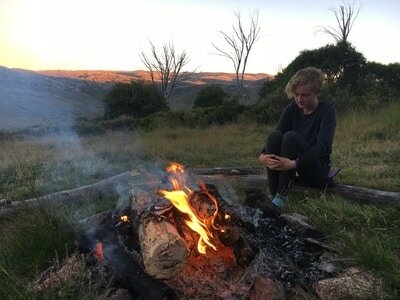 Made camp down beside Wilkinsons Creek just beneath Muellers Peak. 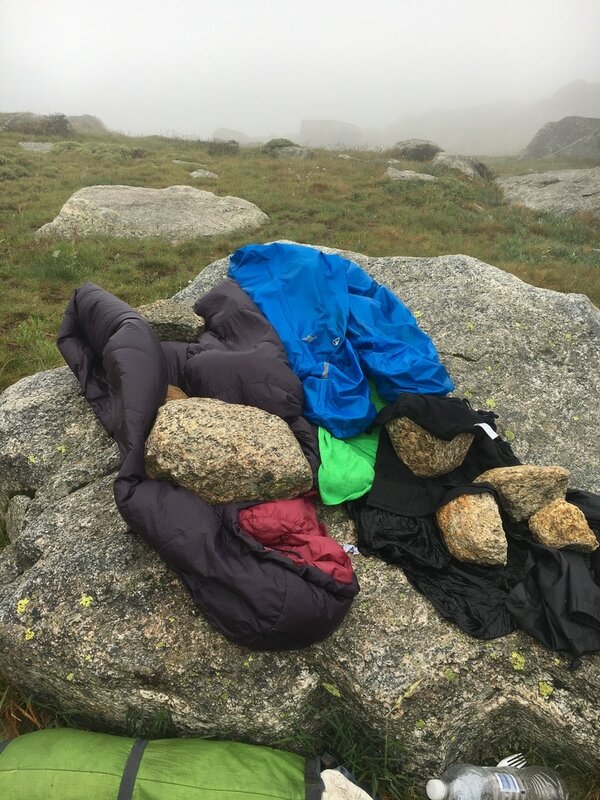 Yesterday's decision to move camps has proved incredibly fortuitous as this morning we woke up to strong wind, rain and no visibility. 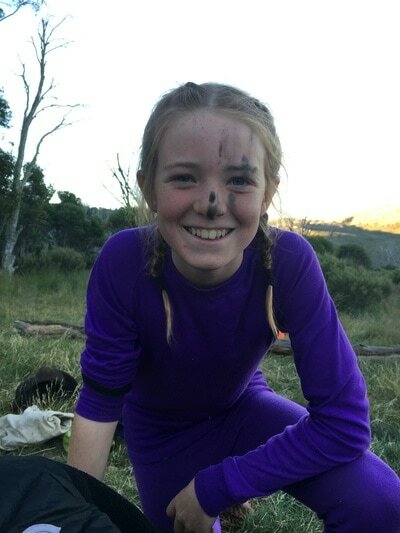 Most of the morning was spent snoozing and making sure the tents stayed up however Scout and Taryn managed to sink their tent and all of Scout's gear, including her sleeping bag by not putting it up properly to start with. 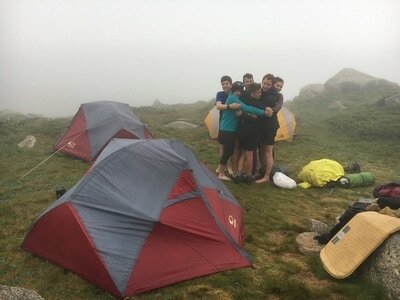 By 3:00 in the afternoon the rain stopped but the low cloud and wind remained. 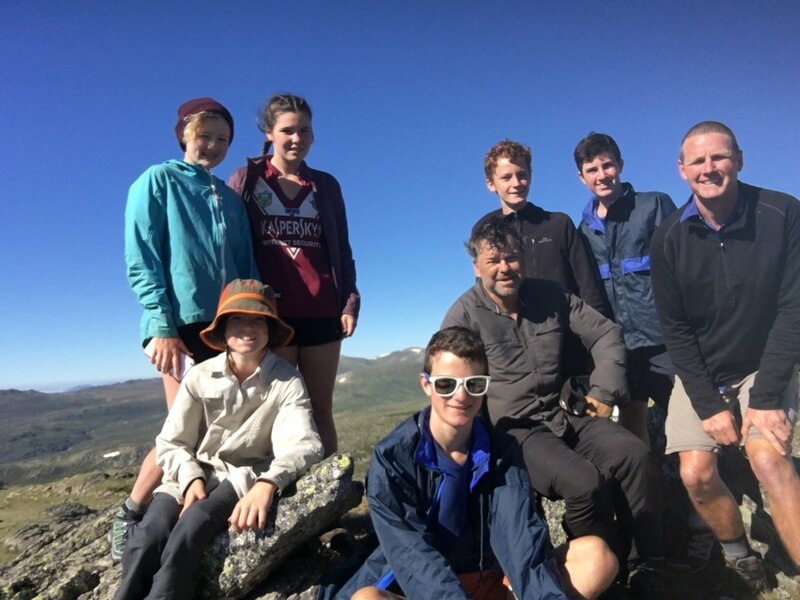 Regardless of this 5 of us (Taryn, Jonah, Nathan, Jeremy, and me) left camp at about 5:00pm to summit the surrounding mountains (Townsend, Abbott Peak and Alice Rawson Peak). 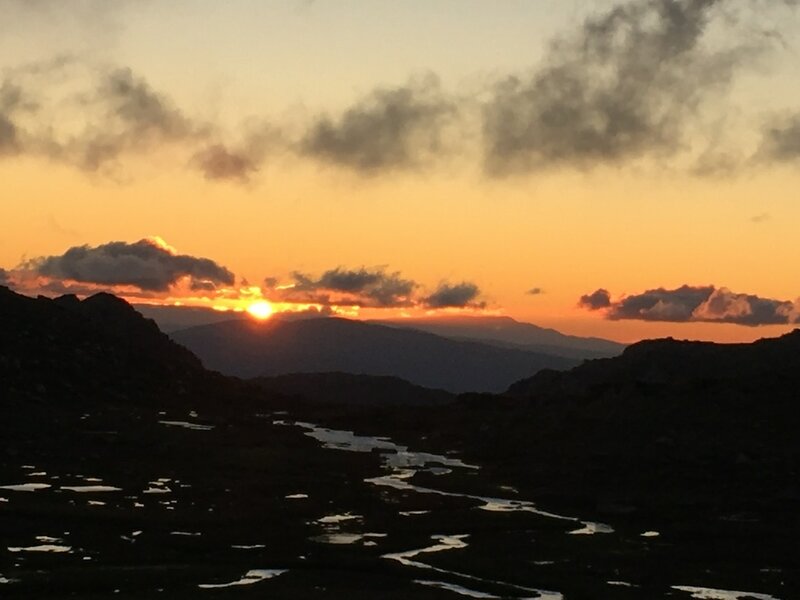 We returned to camp in time to have dinner and enjoy another spectacular sunset under clearing skies. 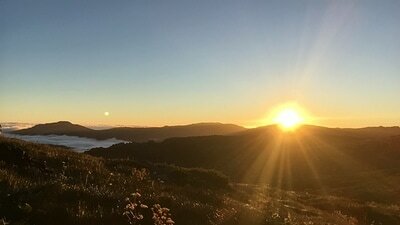 The final day of our hike broke to beautiful sunshine after the wind again raged in the early part of the night, this time without the rain. It is reported the wind gusts were up to 90km/h on the top of Kosci. We packed up early and were going by 7:30am as we needed to be in Thredbo for the bus pick up at 1:30pm, and Jeremy & I were keen to complete the quest for summiting the 12 highest peaks in Australia (the rest of the party were more interested in getting to Thredbo & the bakery to enjoy some “real food”). 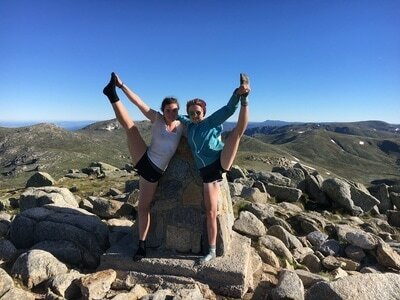 We were all on top of Kosciuszko by 8:30am (well before the normal day hikers had even left Thredbo). 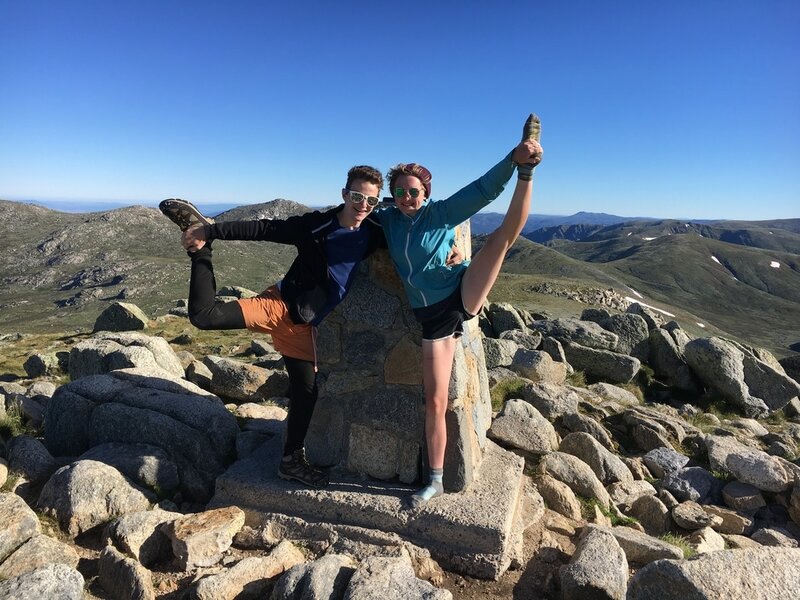 We took some time out to enjoy the view (all the way north to Jagungal) and of course take the mandatory photos. 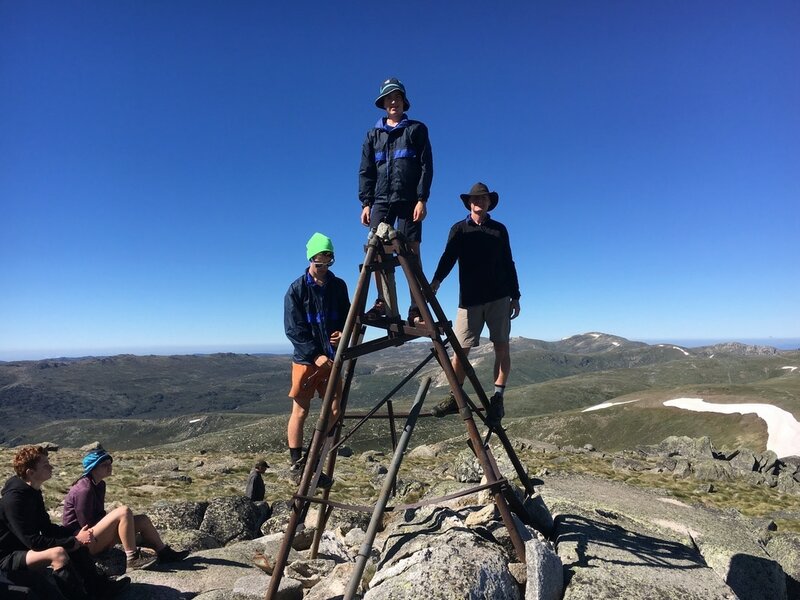 We then performed a quick “scouts own” at the “Roof of Australia” and reflected on the past week and half reminiscing about what we enjoyed about the hike. Jeremy & I then took a different route to the rest of the group as we again went off track to summit Etheridge Ride peak, Rams Head North & Rams Head, whilst the rest of the party followed the Kosciusko Summit walk back into Thredbo. 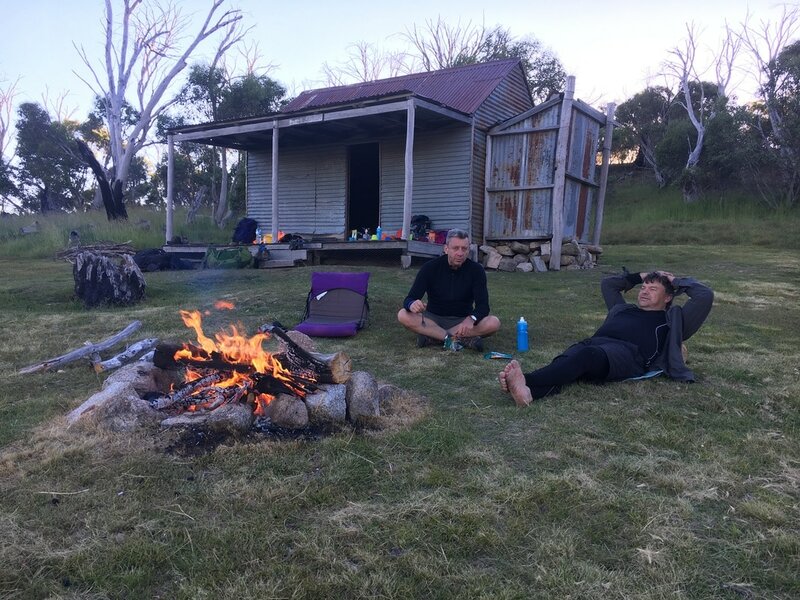 Once back in civilisation it was time to enjoy some great pies, pizzas and Cokes as well as some live music as we waited for the bus to take us back to the cars in Kiandra and back home (thanks Melinda & James from Snow Alliance for arriving on time & putting up with our smell in the back of your bus J).